This place has been on my bucket list (of places to dine) for a very long time. 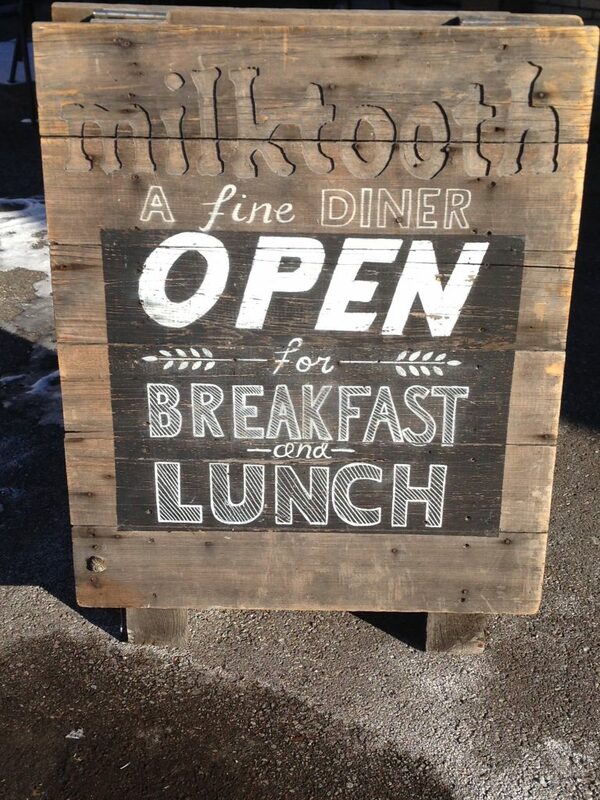 Milktooth is a breakfast and lunch diner in the Fletcher Place area of downtown Indianapolis. I remember reading in a magazine about this place not long after it opened. I continued to follow it as it grew a fan base. The chef/owner was invited with other Indiana chefs to visit the renowned James Beard Foundation. If you don’t know…that’s kind of a big deal. Johnathan Brooks of Milktooth got their attention. This place has been written about in Bon Appétit magazine. Conde Nast Traveler ranked them as one of the best restaurants around the globe. Now that says something doesn’t it? I’m sure they are used to rave reviews so this one won’t be a surprise either. I finally made it down and I love the place. I wish it wasn’t an hour drive to get here for me. This isn’t the run-of-the mill breakfast place. You aren’t going to get eggs, hash browns, and toast. Go to a chain restaurant if that’s what you want. If you aren’t familiar they are located in an old three bay garage on Virginia Avenue. This area has some of the finest dining in Indy but this place “owns” breakfast. Most of the other restaurants’ aren’t open that early. 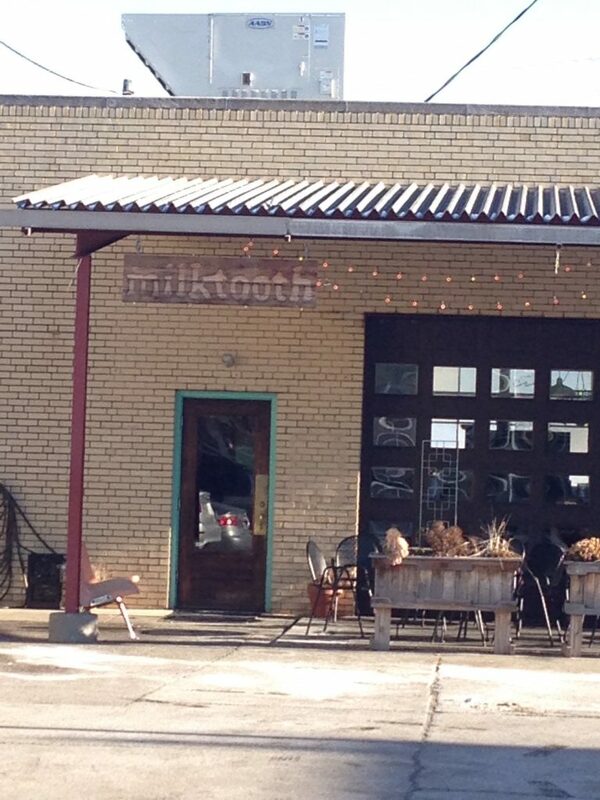 Milktooth has found a great niche. You can get coffee and a pastry to go or while you wait to be seated. They have a rotating menu so you won’t get bored if you are a frequent guest. Milktooth by definition is a baby tooth or primary tooth. I’m not sure how that fits into this picture. 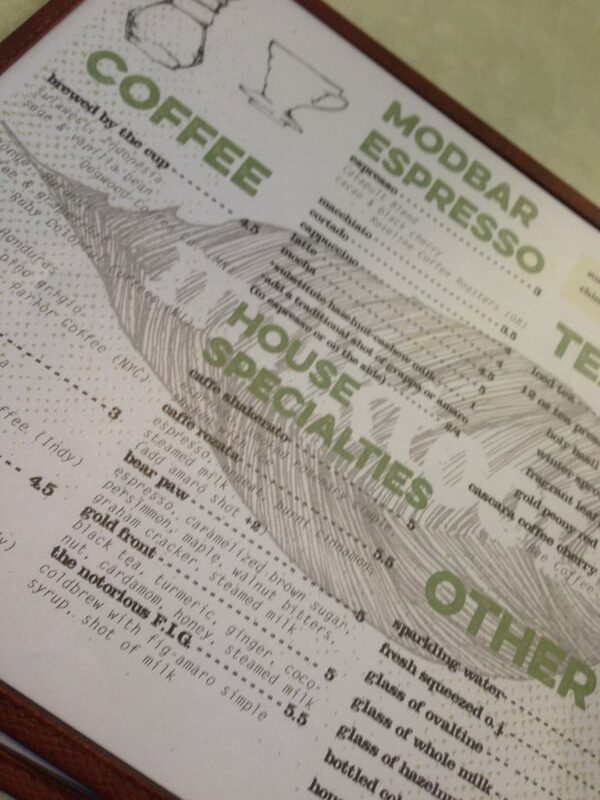 There is a no reservation policy (and no substitutions) so I put my name in and placed an order for coffee. 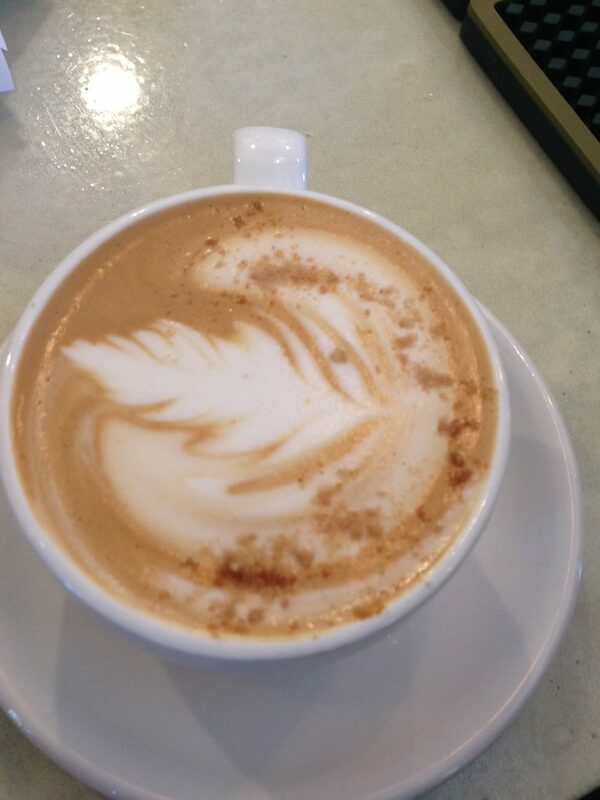 The Bear Paw is espresso, caramelized brown sugar, persimmon maple, walnut bitters, graham cracker and steamed milk. Very tasty! 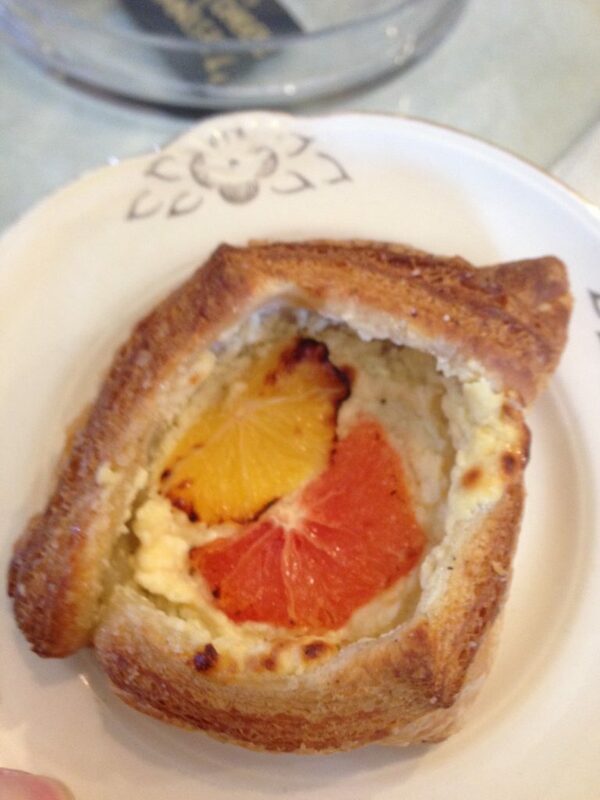 My husband got a Danish with cream cheese and passion fruit. I don’t like pastries or sweet breakfast items but I could easily do this. There were young people coming in just for coffee and a Danish pastry. I was told it would be 45 minutes but it really only took about 15 to 20 for us to get seated. That was plenty of time to take a few photos and review the menu. Mix and match plates, silverware in coffee tins, small cacti in pots at the counter top, mix and match chairs, and novena candles with celebrities is what you get. I’m not sure if you would call it retro chic or just garage sale leftovers but the décor works even the wall paper covered in peaches under the counter. 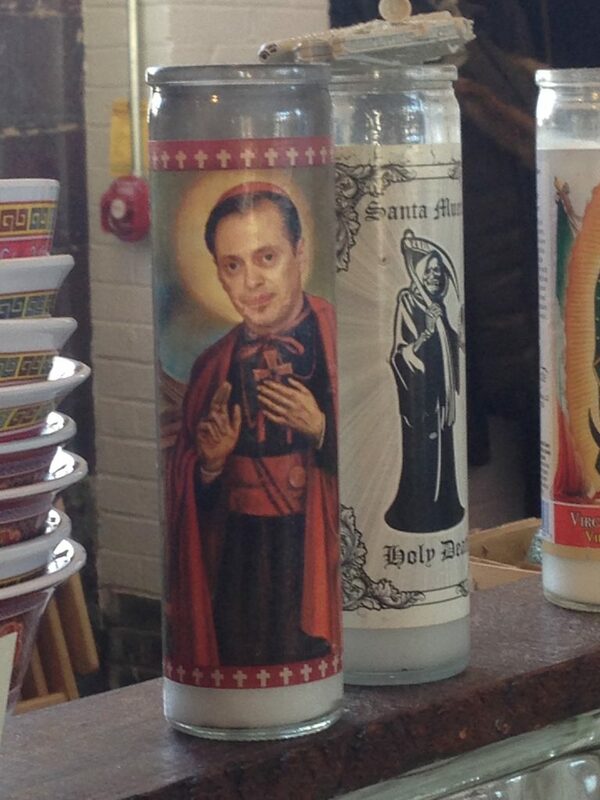 Steve Buscemi immortalized on a candle. Being seated at the counter top was perfect. I could see all the culinary creations and every dish that came up looked like a work of art. There were about five guys behind the counter making various dishes. Each had a job to do and it is a well-oiled machine. I understand there is a pastry chef but they were busy. I didn’t ask to speak to any of the staff/owners. 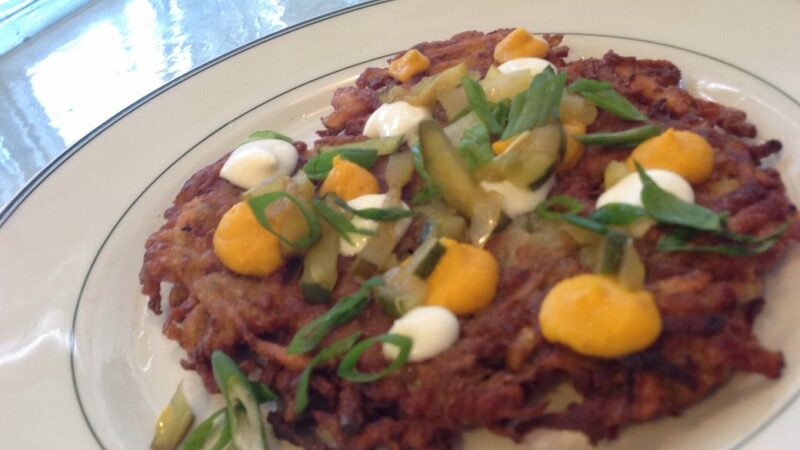 I ordered the Potatoes and Rutabaga Latke (who cooks rutabagas these days? ), Confit of Bluefish Tuna on house Rye Bialy and my husband ordered the Dutch baby pancake with Roasted Broccoli and aged cheddar. It also had beer mustard, pickled fennel, hazelnuts and mustard greens. There always seems to be Dutch baby pancakes on the menu but they reinvent them with new ingredients from time to time. It’s a seriously good portion. You won’t leave hungry. I wanted to get the Sorghum Bacon and Sour Cream Biscuit but I just didn’t think I could eat all of this. We ordered some Chocolate Chip cookies to go which were served in popcorn bags. 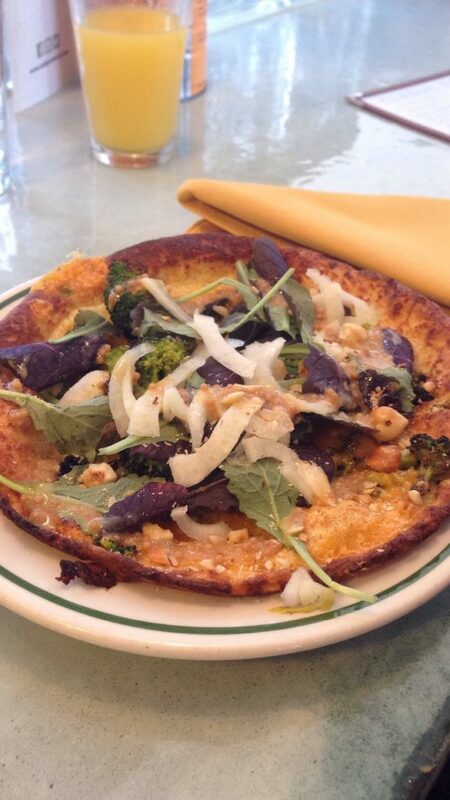 Dutch baby pancake with Roasted Broccoli and aged cheddar. You can get a cocktail or beer if you like. 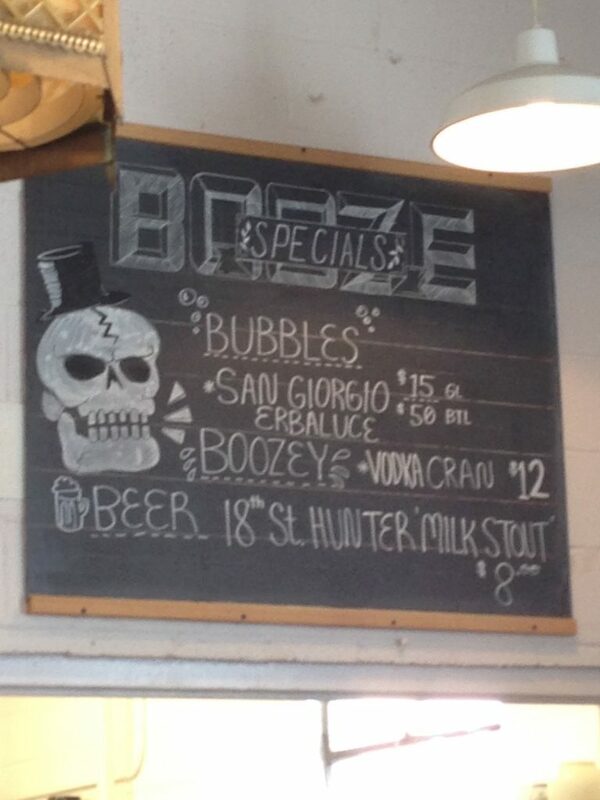 There is a great drink menu to peruse. It was 10:30 a.m. so I decided to pass this time. Maybe for lunch on another visit? They had a steady crowd the entire time we were there. In the summer there is outside seating. How would I describe Milktooth? Comfort food on steroids? Upscale diner food? I’m not sure how to describe it. All I can say is that you have to come see for yourself. If you have little kids that can’t sit still this may not be the place for you. Check them out at milktoothindy.com or drive down and visit them at 534 Virginia Ave Indianapolis. If you know of another great breakfast/brunch place please comment below! I love hearing about good food.